Take a walk on the wild side, and plan your next vacation for a Masai Mara safari. Spending some time on one of the beautiful Kenyan beaches is great, but you’ll get the most out of your trip to Kenya if you combine it with a safari. And Masai Mara National Reserve is without doubt the most popular of all the Kenyan wildlife resorts. What Can You Expect on a Masai Mara Safari? 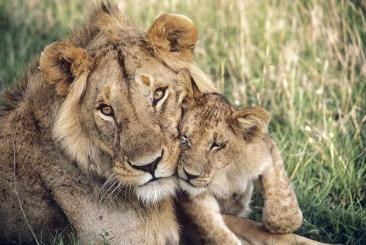 The main reason for going to Masai Mara is to see the amazing wildlife and animals that Africa is so famous for. Masai Mara offers one of the biggest chances to see all of the “Big Five - elephants, lions, buffalo, rhinoceros and leopards – in one park. Moreover, during July and September Masai Mara National Reserve is the place where the annual Wildebeest Migration takes place. Half a million wildebeests trek from Tanzania to Kenya and back again then. You can get a preview by watching the awesome Wildebeest Migration movie in the movie archive. So try to arrange your Masai Mara safari for sometime between July and September. All tours offered to the park will be different, but a safari typically lasts between three to seven days. Accommodations are usually part of the deal, and there will be several tours through the park during your stay. Some will offer jeep drives and some have walking tours. See if you can find a tour that will show you the villages of the Masai themselves. But do this with a good guide – he or she will know how to avoid your visit turning into a high-pressured sales event. Increasingly popular are the “balloon safaris”, which actually aren’t full safaris but hot air balloon trips of a few hours right after sunrise. Though not cheap, they offer a fantastic view of the wildlife. The Masai Mara game preserve is huge, and is located in the south of Kenya along the border with Tanzania. Beyond the Tanzania border, the park actually continues as the Serengeti National Park. Depending on your interest in African scenery and your budget, you can take a 5-6 hour drive from the Kenyan capitol of Nairobi or hop on a plane for an hour-long flight. While the drive might be long and dusty, how can you pass up the opportunity to see all that beautiful savannah landscape? There are fees to enter the park, but these are usually included in the price of your tour package. You can either stay in luxury at one of the many lodges inside the park, or really embrace your inner adventurer and stay at one of the tent campgrounds (the budget option). Either way, you get to stay right in the park. This gives you the chance to hear the sounds of the night, an added experience that adds that extra something unique to your safari trip. The name of the park might sound familiar. It's named for the Masai people who live in the area, the most famous of all the African tribes. Have you seen any African documentaries that show native tribes who leap into the air as they dance? Big chance those are the Masai warriors. There is plenty of adventure to be had in Kenya, but I think the top of the list has to be the experience of a Masai Mara safari. Movie review - "The White Masai"